upcoming trends that will dominate the accounting industry. Accounting sector has seen many transformations in the year 2017, and changes indicate no signs of slowing down. Every year brings new trends which shake up the system, and it’s time for accounting firms to jump the bandwagon. With new technologies and innovations, the accounting sector continues to evolve and thrive. Firms should be aware of the latest and upcoming trends in order to simplify their work and reshape their business. One of the major trends expected to affect the accounting industry is its integration with the cloud environment. Cloud computing will not only enhance the performance of the accounting firms but a level of security that is vital for any accounting process. Mobile accounting and social media are also anticipated to flourish. Apart from these, there are other trends as well that will be influential in shaping modern accounting in 2018. 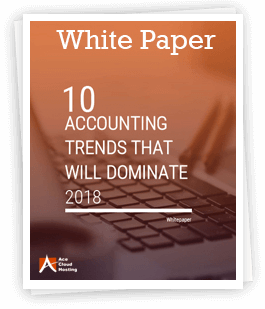 The whitepaper explains these future trends for accounting firms.